This pouch style case functions well in a variety of environments including Policing and Security, Warehousing, Manufacturing and would be ideal for any type of employee in the field. This case is designed using System Wear’s unique, custom made high-density foam material. Pouch-style case features a front pocket to hold an extra battery. 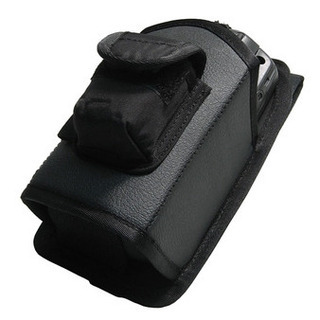 Heavy Duty swivel clip allows the case to move freely while being worn. The case is comfortable and easy to use ensuring that the handheld mobile computer is kept on the employee, thereby preventing loss and damage to the device. Can accommodate both the MC70/75 with the antenna or without.